My laptop is being a little terror so I thought I would go for a different kind of post this week called Feature Friday, I love food It's one of my favourite things and I was so excited to try out my first ever *Gousto box which I received a few weeks ago now. I picked two different meals which I thought I would like the most and within a week and a half I received it. It was packaged really well and even had some ice packs in to keep all the meat cool. 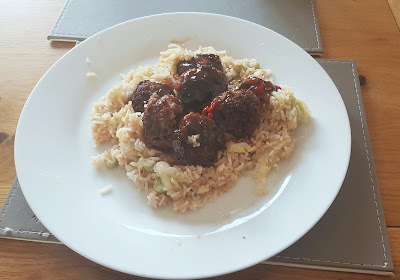 I chose the bunless burger and Hoisin Chinese meatballs, I didn't end up taking a picture of the burger because it completely went from my mind but I did manage to take a picture of how my meatballs turned out, they look a lot different from the picture but they turned out really well. 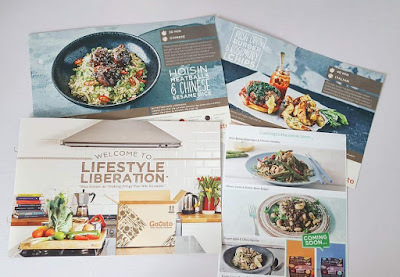 It was so simple and easy to choose what meals I wanted and you're able to put your subscription on hold if you're not able to afford it that month. 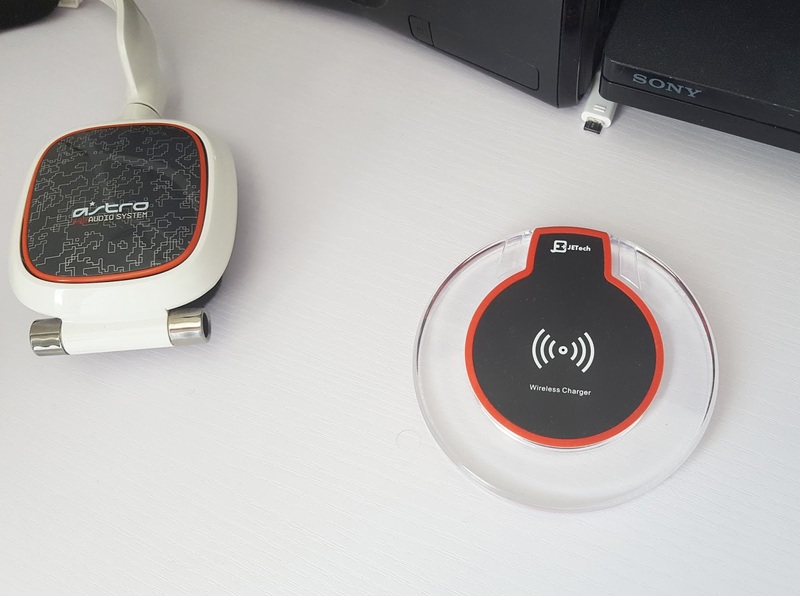 Next up is my wireless Samsung charger, I was so annoyed the other week because my Fitbit, laptop and phone all stopped working within the same week. I was raging over it and felt like more was going to break or go wrong, luckily it didn't and I was able to get my Samsung to do as it was told. The issue was that it would no longer charge via the charging slot on the phone so I had to order a wireless charger, after a few days I decided to try and use a cable again and for some odd reason its working fine, I'm not sure if it was because of the wireless charger or because I did the new update on my phone, either way, I'm not complaining and I've now got a handy little charger to use that's wireless instead of having to plug my phone in all the time. If you do ever get a Samsung just be aware of the charging problems, I had no idea and felt like I had basically wasted £200+ on a phone and was devastated by it, I hope it doesn't stop working again. I was recently sent a pixel necklace from *This Is Fox Fire it's not a normal kind of necklace it has a little secret, the back of the necklace isn't covered in any paint or glossed over its just raw ceramic and the reason for this is so that you can add a couple drops of essential oil or perfume onto the back of it. The smell stays on the back of it for a while so if you pop on the necklace and forget to wear some perfume the necklace pendant already has the smell on it which I like. 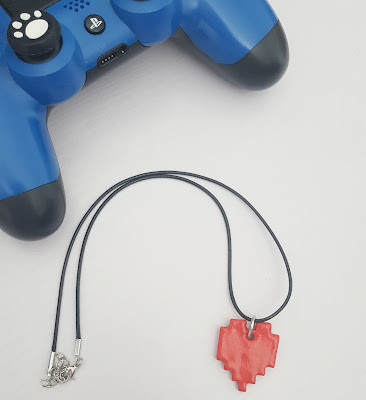 The style of this pendant is a pixel heart and as you all know I love pixel art but she has other styles available in her Etsy store. The woman who runs This is fox fire also loves to donate to charity so she donates her products to be auctioned off to raise money which I think is a wonderful idea. lastly is the *wowboxme I received, I was so surprised with the box arriving and didn't have much food in the house that day so it was much needed, it was full of so many healthy yummy snacks which I'm still working my way through, we had the chardonnay with our meatballs and spaghetti and it was delicious. 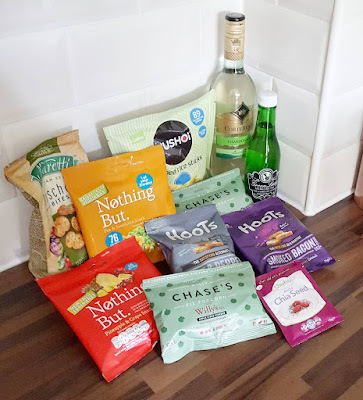 My favourite things from the box were the smokey bacon hoots, apple cider popcorn and pea rice sticks, I'm not a huge lover of everything healthy and I have to admit I do like junk food more but getting this box made me realise there are lots of yummy and healthy alternatives that I can try. If you want to try this subscription box and get your first month free check out wowboxme HERE. I would also like to add thanks to everyone's kind donations and sharing my gofundme I went over my goal by £5 and raised £205 for the Pregnancy Sickness Support, If you still want to help you can find out how HERE. Sounds like you had a busy week! The boxes you tried this week were so interesting - need to invest in testing those myself I think! Throwback Thursday | Theme Park World.